Why order stained glass online when you can visit Amanda’s Glass Art and hand-pick the glass you desire. Don’t wait for your glass to be delivered and risk damage, never pay shipping charges again. Conveniently located on MacCorkle Avenue in Kanawha City, walk in Amanda’s and walk out with everything you need to finish your project today! A large variety of Spectrum glass also known as beginner’s glass is stocked by Amanda’s Glass Art. It is some of the softest and most uniform glass on the market and the easiest for beginning glass hobbyists to cut and use. Fusing compatible glass is at the studio in both 96 COE and 90 COE and includes Spectrum, Bullseye, Wasser, and Dichroic glass used in jewelry. Specialty clear glass and clear plate glass used in cabinets is also in stock at AGA. 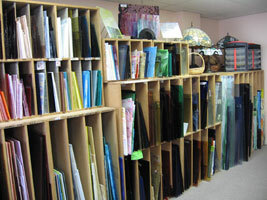 All standard stained glass supplies and equipment are regularly stocked at Amanda's Glass Art. Don't pay shipping to get solder or lead - visit AGA and get everything you need. Cutting, soldering, and building tools along with larger equipment including grinders, kilns, and glass saws are available for purchase at AGA. Don't know which glass cutter is right for you? Get a professional's opinion at Amanda's Glass Art. 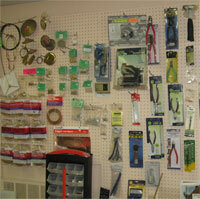 Basic Glass Tools including a variety of glass cutters, copper foil, solder, and soldering irons are kept in stock. H and U Channel Caming are also available for purchase in 6 foot strips of lead, zinc, brass, and copper. Glass Bevels can be found at AGA in all different shapes and sizes. Glass Nuggets and Jewels are stocked in an assortment of colors and sizes. Larger equipment including grinders, glass saws, and glass kilns. Fusing supplies are also carried and include fiber paper, high temperature wire, glass frits, stringers, and confetti glass. Visit us today and see for yourself what Amanda’s Glass Art has to offer you!